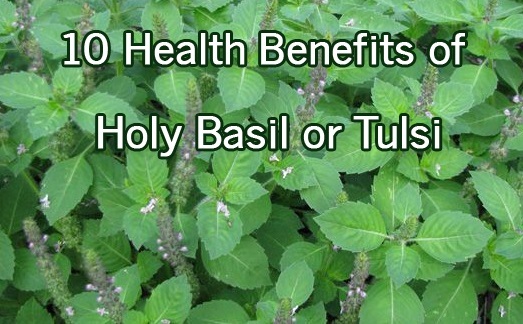 Holy Basil or Tulsi has a special significance in Indian culture and Hindi religion. It is not only a great herbal remedy for lots of common health problems but it is also considered important from religious point of view which is why it is worshipped in most of the Hindu households. It comes with amazing benefits for health and plays an effective role in keeping you fit and fine. This article talks about few health benefits of Tulsi which can be extremely helpful. Basil leaves work beautifully in case of fevers. Drinking tea prepared with the miraculous Tulsi leaves is one of the best preventive herbal treatments for all kinds of fevers in rainy season. Juice of holy basil leaves is also very effective in controlling the body temperatures. It is one of the best homemade medicines for people of all age groups. It is the best herb for treating cold and cough. In fact, all the cough and cold medicines have holy basil leaves as the main ingredient. It is very effective in throwing the cough out of the body. It is also helpful in asthmatic problems. You can prepare a hot tea prepared with Tulsi leaves and ginger to get relief from cough. Tulsi leaves come with amazing power to heal the bronchitis related problems. It’s a great healer for respiration related issues. It imparts strength and stamina to the body thereby making your body stronger against diseases. Tulsi is found to be very effective in reducing the level of blood cholesterol thereby promising a healthier and fitter heart. It is considered to be the best medicine for those who are suffering from cardiac problems as it is very effective in reducing the weakness and regaining the lost stamina of the body. This herb works wonderfully on respiratory related problems. Preparing a herbal drink using the decoction of Tulsi leaves with honey and ginger is a divine combination for all kinds of problems like throat infections, sore throat, cold, cough etc. Over the years, kidney stone has become quite a common problem. Juice of basil leaves mixed with honey is an easy and effective cure for kidney stones. It is believed that regular consumption of this juice for 6 months expels the stone from your system via urine. Basil leaves are an effective anti-stress agent. Regularly chewing 12 basil leaves twice a day is an effective anti-stress home remedy. These are an amazing treatment for ulcers and other infections in mouth. It is a curative and preventive herb for insect bites and stings. Applying fresh tulsi leaves juice on affected areas brings instant relief. These are only general guidelines for Tulsi as a first aid. You are advised to seek guidance of physician before using this amazing herb.